Get Your Grub On @ The Glendon. Snacky Stuff @ a Classy Spot. The Glendon. Westwood, CA. Kids got it good nowadays. If I sound like an old man, that's because I am. Years back when I was striving for a higher education and wanted to take a little snack break at my local pub, the best I could hope for was a cheap buffet of nachos, potstickers and hot wings (most of which was too salty, prompting us to drink more booze which was the ultimate objective for both the establishment and its clientele). 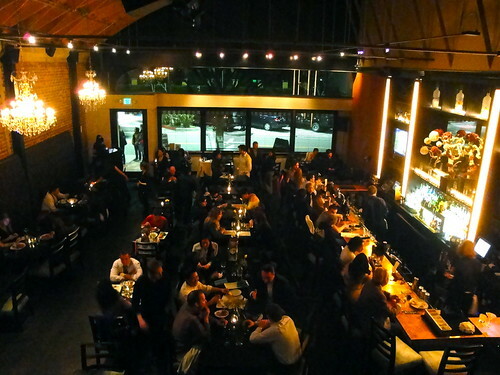 The Glendon Bar & Kitchen is a place I wish had existed when I hungered for a spot where me and my college friends could hang, eat, drink and mingle. The Glendon's Happy Hour menu is where it's at with a five dollar appetizer and dessert menu along with five dollar Stoli martinis to wash it all down. To sweeten this deal, there are 50% off specialty pizzas and more cheap booze, all priced at around the five dollar range. When I was in college five bucks got me the genesis of a hangover and food just shy of truck stop slop. Like I said, the kids got it good today. Doo, dah, dippity! Black bean hummus. You won't find a melted mound of Velveeta and salty nachos anywhere up in da Glendon. Instead your server will set down something your mom would be happy about you eating, something even *gasp! * healthy. 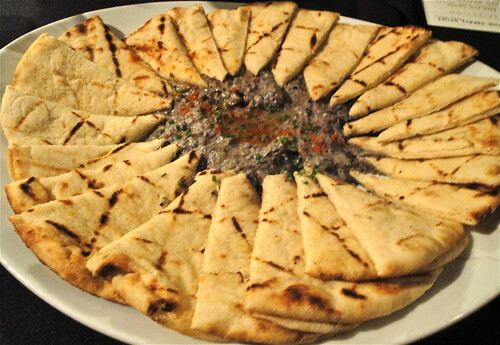 A plate of Black Bean Hummus encircled by fresh flat bread was a nice light way to kick off a night of bites. Like the description says it's hummus without the usual chickpeas; instead black beans make this dense dip. So fresh you wanna file charges! Another fairly healthy yet tasty option is the Caprese Tar Tar, a playful reimagining of Insalata Caprese that Nick Jacobs, Executive Chef at The Glendon, dreamed up. He works in all the major components of the classic salad from Capri (tomato, buffalo mozzarella and basil) and presents it as a "tartare". Top off a freshly grilled bit of baguette and enjoy the colors of Italy. 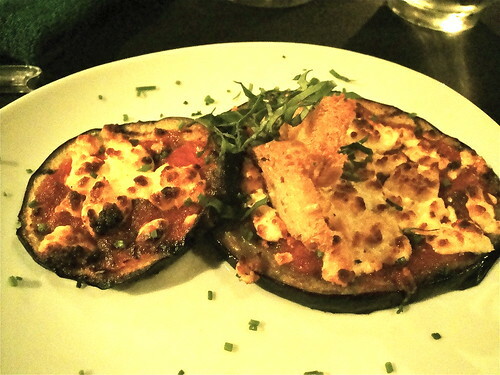 Not sure how well the Roasted Goat Cheese Eggplant will do with a college crowd, but it may be appreciated by others with more refined palates or even the occasional college student who has a refined palate. It paired nicely with the mellow Radio Boca Tempranillo. What brings back the hazy memories of your college daze better than group shots? 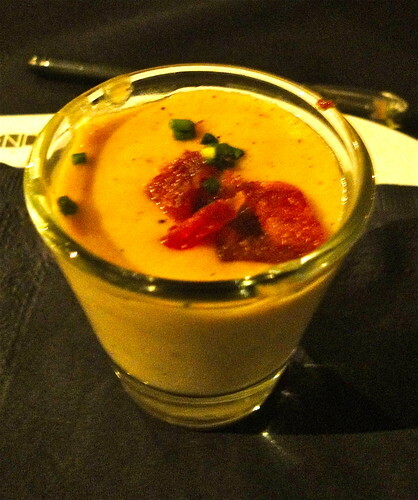 Although this scrumptious swallow of soup is only in the experimental stages (with a select few as guinea pigs), the Bacon Potato Soup Shooter was a nice intermission between chewing and biting. Thick, decadent and rich, it was like slurping up a gravy only with more dimension. This tiny tease was one of those items I definitely wanted more of. Another round, chef! 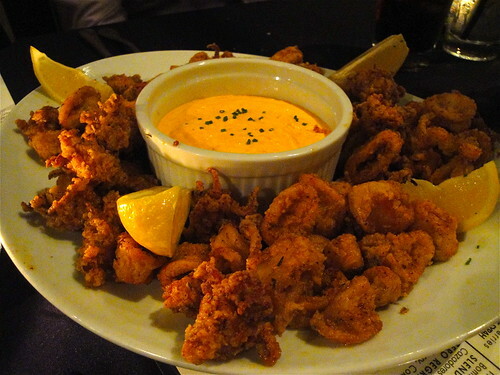 There is no bar menu without calamari and The Glendon's Cajun Calamari hits the spot with its profoundly salty, spicy, crunchy and super satisfying tender bits of calamari. Dunk it into the spicy red pepper aioli and you'll be reaching for your five buck happy hour Stella Artois for relief right quick. Baked Brie and Fig Toast. 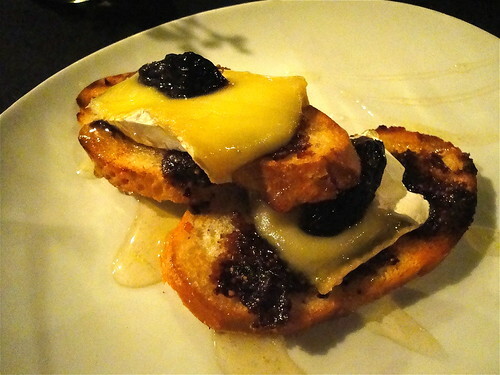 The Baked Brie and Fig Toast is a delicate, almost feminine, small plate that glistens when it arrives to the table. The soft and creamy, savory, salty and slightly pungent characteristics of the baked brie blend harmoniously with the mashed sweet and earthy fig. On top of crunchy bread and drizzled with orange harvest honey, the experience is sublime. Suddenly things get meatier and masculin-er when the Whiskey BBQ Meatballs hit the table. 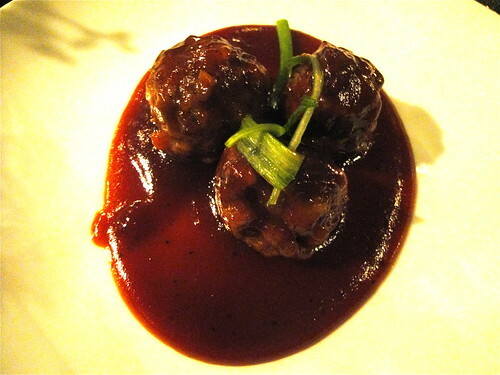 This trio of balls is dense with the big flavor of hickory rounded out by sweet and spicy. These balls satiate. Yep, another fusion taco on a bar menu. I was hesitant about this one as soon as I saw it on the offerings. With Kogi ruling the Korean taco scene, how does anyone step up to that? Although at the tasting I attended this MexAsian taco was called Korean Pork Belly Taco, there was nothing Korean about the taco. Nothing! However, that doesn't mean it wasn't tasty. It was. The name is simply a misnomer. The Korean Pork Belly Taco itself was a miniature packet of flavorful cured pork belly marinated in a teriyaki Sriracha sauce. Interestingly, Chef Nick Jacobs opted for a teensy flour tortilla rather than the traditional corn tortilla. It was another "uh oh" moment for me but it actually worked and highlighted the flavors of the filling more. I'm told this taco will be renamed soon. 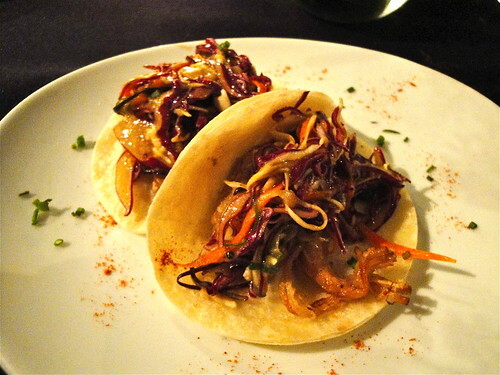 How about the Sriyaki Belly Taco? What? Too weird? I used to claim that I'm not a dessert person. Well, lately that's been untrue. Either I'm becoming a sweet tooth the older I get, or the desserts out there are just getting better. 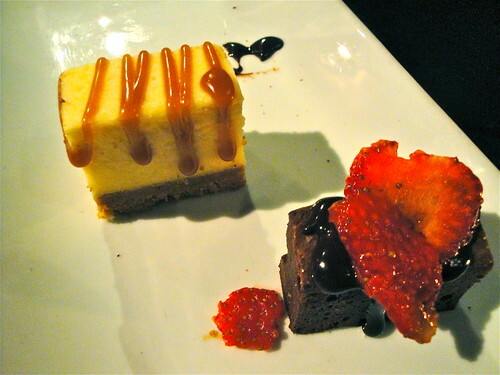 The Glendon's Chocolate Brownie Strawberry and Caramel Cheesecake are a delicious duo. The brownie is simply rich and amazing. The rush of chocolate is immediate and intoxicating. 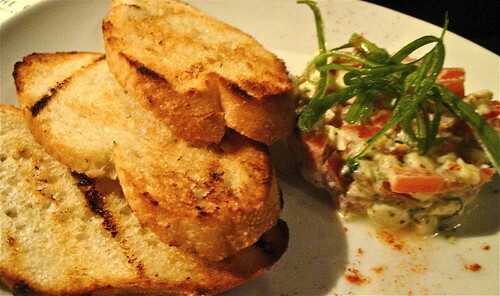 Most of the items on The Glendon's "The Small Stuff" or tapas menu are hard to resist. However, combine these delicious nibbles with cheap booze and they become impossible to resist.